Have you ever struggled to tune your guitar by ear? Or had one of your bandmates ask, “are you sure you’re in tune?” Or thought to yourself that something about your sound just seems off? Or you just put some new strings on your guitar and you’re tired of completely retuning every five minutes? Even the best acoustic guitars need to be tuned frequently. 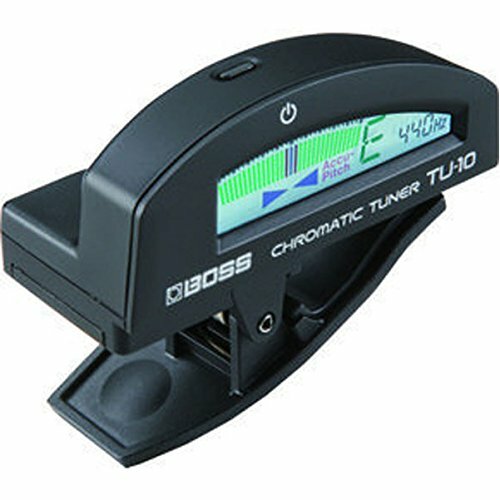 A good clip-on guitar tuner can help you solve these common tuning problems. Clip-on tuners work by sensing the vibrations made by your guitar as the sound resonates, and they are a portable and convenient option for acoustic guitar players. But which is the best guitar tuner for your specific needs? Here I’ll run down a few popular and reliable options for the best tuners that will meet your needs and help you keep your guitar in tune. Snark tuners are probably the most widely sold and widely used tuners out there, and they’ve been the go-to choice of guitar players for years. The Snark SN-8 is the latest version of this classic. It features more precise tuning than previous models (or “super tight” tuning). It also has a brighter display with larger lines that’s much easier to read than earlier Snarks. Another important feature is the color display that rotates a full 360 degrees, which allows you to find just the right harmonic sweet spot on your guitar while still being able to easily monitor your tuning. 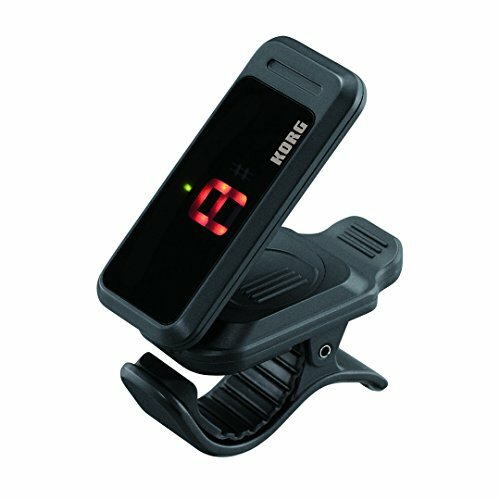 This may not be the model with the most bells and whistles on our list, but the reliability and price make this a serious contender for the best clip-on guitar tuner. 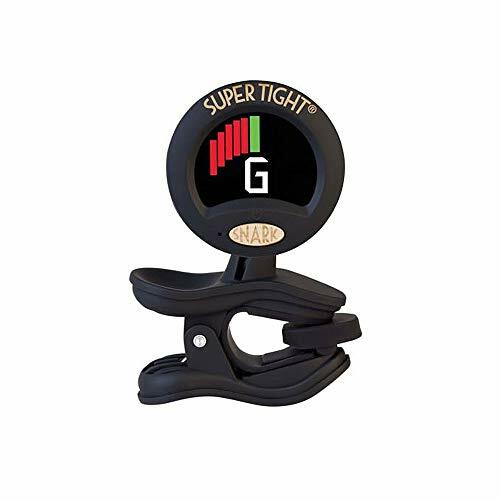 Another great value on our list, this durable clip-on tuner is portable and feature-rich. With its compact profile and LED display, the Korg PC-1 Pitchclip sits low on your headstock while keeping your readings visible. While there’s no rotating ball joint, the flip up feature allows the user to move the pivoting display to any position in a 180 degree arc for multiple viewing angles. As an added versatility feature, the display reverse mode allows the readout to quickly reverse from top to bottom, allowing you to clip the tuner to either the front or back of your guitar. Featuring Peterson’s renowned fine tuning accuracy, it’s a no brainer that the StroboClip tuner made it onto our list of best clip-on guitar tuners. 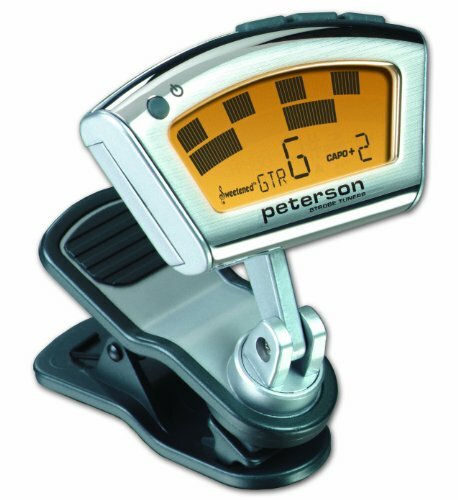 The Peterson StroboClip may set you back a little more than Korg or Snark models, but the attention to detail and extra features such as Sweetened Tunings and presets for tuning a wide variety of instruments, all make this tuner a worthy investment. As far as accuracy goes, you can’t beat Peterson’s 1/10 of a cent precision. The StroboClip makes it easy to hone in on the perfect pitch, whereas many other tuners show that you’re in tune even when you may be slightly out. The smooth, real-time display of this tuner also makes this a perfect model for gigging and situations where quick tuning is necessary. Another budget contender for the best guitar tuner, the Boss TU-10 offers great ease of use and accuracy without breaking the bank. What sets the TU-10 apart from some of the other wallet-friendly models on our best tuner list is the innovative, easy to read “true color” LCD display screen. The screen provides a multi-colored and incredibly responsive visual experience, enabling you to more accurately adjust your tuning on the go. Overall the TU-10 is incredibly user friendly, but if we had to ding it for anything it would be the lack of a fully rotating pivoting display as found on the Snark. We saved this tuner for last, but it may be one of our favorites on the list. 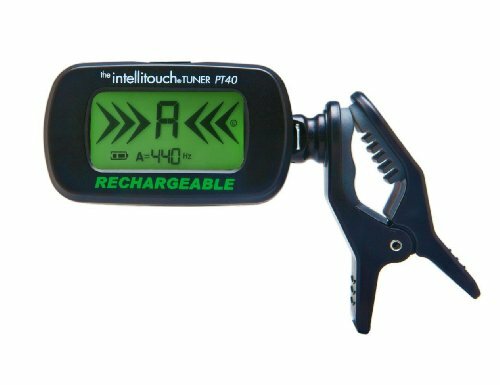 A back-lit display on the Intellitouch PT40 Tuner makes it easy to tune while playing in low lighting, such as onstage or in poorly lit rehearsal spaces. The ball joint assembly connecting the display to the clip also provides versatility for use at multiple angles. Precision tuning is also top notch on this model, which flashes green light on the display when in tune, red when not. Best of all, the Intellitouch PT40 is rechargeable with the included USB cord, so no replacing batteries. There are many factors that go into picking the best clip on tuner for your needs. Price, precision, convenience, durability, and display quality all come into play. There are some great budget tuners on this list, and more expensive models that offer extremely high accuracy. But you can’t go wrong with any of these models, and all of them will have you on your way to that perfectly tuned sound in no time. None of theses tuners are any good outside in bright light. Please advise on one I can easily see and I will buy it! Thanks for the comment! Snark has another model called the Super Snark that is much easier to view outside and under bright lighting. It also picks up the notes you’re playing much faster than any other Snark I’ve used. It’s about twice the price of a standard Snark, but I think it’s worth it. We’ll be updating our tuner recommendations for 2018, and will include the Super Snark on the list. It’s not available on Amazon, but you can get it here at Musician’s Friend.